Clth, 9.5 x 11.75 in. / 384 pgs / 280 color / 9 bw. Introduction by Dr. José Narro Robles, Consuelo Sáizar, Vanessa Bohórquez. Text by Andrés Blaisten, Olga Sáenz, Jorge Alberto Manrique, et al. 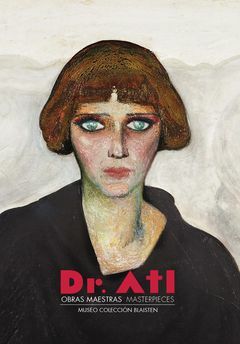 Inspired by Luis Coto, José María Velasco, Toulouse-Lautrec and Edvard Munch, the painter, volcanologist and teacher Gerardo Murillo, aka Dr. Atl (1875–1964) infused Mexican landscape painting with a surprising, unique modernity. His roiling, animated landscapes were prompted in part by his fondness for the volcanoes at Popocatépetl and Iztaccíhuatl, which he portrayed over and over in both paintings and drawings. To achieve his sizzling chromatic effects, Dr. Atl devised and used bars of pigment, wax and dry resins, which lend his work a lively, even pantheistic feel. Dr. Atl: Masterpieces is the most complete overview of this much loved Mexican artist in any language. Reproducing 104 paintings and 85 drawings--ranging from landscapes to his fascinating portraits that use a curvilinear perspective--it celebrates an intriguing and influential protagonist of Mexican modernism. FORMAT: Clth, 9.5 x 11.75 in. / 384 pgs / 280 color / 9 b&w.